TIPA-Corp is a breakthrough company that offers a viable sustainable alternative to Conventional flexible plastic packaging. TIPA-Corp develops and produces novel fully compostable packaging for the food & non-food industries. TIPA’s packages are, fully compostable and partially bio-based while providing the superior mechanical properties as conventional plastic packaging and ensures the package's end of life will be fully compostable, just like an orange peel. Daphna is the Co-Founder and CEO of Tipa, a company she founded together with Tal Neuman. 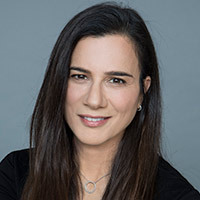 Prior to founding TIPA in 2010, Daphna served as the CEO of the Caesarea Center for Capital Markets and Risk Management at the Interdisciplinary Center (IDC), Herzliya, Israel’s first private University. Prior to that, she held various management positions at SPL Worldgroup Ltd, a software company, and prior to that she was a project manager at Whelty Lager Ltd., Boston MA, USA. Daphna holds an MBA (with honors) in Marketing and Entrepreneurship from IDC Herzliya and a BA in Economics and Software Engineering from the Bar Ilan University. Daphna is a graduate of the elite Israeli Army Mamram program and served in the Israeli Navy software unit as a Captain.